The summer of 1985 was an interesting time in my life. It started with my brother Bruce going to sell his Ford Pinto to my little brother Duane and needing someone to drive it down from Pocatello to Santa Ana. I was the perfect choice to do that job. A little Amtrak trip up and a drive back. My parents then asked me if I wanted to ride the Cumbres and Toltec Scenic Railroad with them for the first time and then revisit the now Durango and Silverton and ride the Silverton. They wanted to spent some time in Las Vegas so I booked an Amtrak trip using a one region All Aboard America Fare first making a roundtrip out to Deming, New Mexico on the Sunset Limited before making a one way trip out to Albuquerque where I would met them. We would ride the two narrow gauge railroads then drive to Pocatello where I would spend a few days before driving the Pinto to Southern California. I took a usual San Diegan to Los Angeles Union Station where I transferred to the eastbound Sunset Limited for the trip to Deming. It was another relaxing trip on the Sunset with an on time departure and the usual nightcaps in the lounge before I called it a night east of Apex. 7/27/85 I awoke about an hour west of Phoenix and enjoyed the early morning with screwdrivers as we passed through the Saguaro Cactus into town. I detrained long enough to get a newspaper before just enjoying the ride the rest of the way to Deming. We passed a flood of freight trains along the way but ran perfectly on time. I detrained at Deming at Deming and walked to the motel for an evening of rest and drinking. 7/28/85 The next morning I slept late and enjoyed a late breakfast before going back to the railroad to shot a parade of freight trains. Tiring of that, I found a bar and enjoyed a few hours of drinking and watching Auto Racing. That killed the time until I walked back to the Deming Station and right on time the westbound Sunset Limited pulled in. I boarded and went upstairs into the coach getting looks from people like "Where did you come from?" I love it when I get those looks. I enjoyed a steak dinner before a great sunset while I enjoyed my after dinner drinks which led me to my nightcaps before I returned to my coach seat and fell asleep. 7/29/85 I awoke with the train almost through San Timiteo Canyon before we passed through West Colton Yard and arrived at Union station in Los Angeles on time. A quick San Diegan to Santa Ana and I would be home for just one night before I started my next rail adventure. After sleeping in my own bed for just one night, I was back at the Santa Ana train station to wait for a San Diegan # 583 for the quick trip to Los Angeles. After an across the platform transfer to the Southwest Chief, we left Los Angeles Union Station on time and I spent the evening in the lounge car drinking through Pasadena, Pomona and San Bernardino then up and over Cajon Pass calling it a night. 7/31/85 I awoke the next morning in the pine forests west of Flagstaff. The train ran right on time the whole way and at Gallup the Indian Guide gave a talk all the way along the route to Albuquerque pointing out all the interesting locations and telling tribal stories. We arrived in New Mexico's largest city early with my parents there to meet me. We drove north to Santa Fe and then turned northwestward heading to Chama, New Mexico. As we drove through town, off to the right by the coaling tower was a C&TSRR K-36 steam engine 488 painted up in Rio Grande to pull a special train tomorrow morning. A stop was made for pictures before we drove in the camper to a campground right along the railroad on the Chama River where we stayed. I woke early and while we were having breakfast in the camper, I heard the chugging of a steam locomotive coming our way. I walked outside and over by the tracks to see the Rio Grande lettered 488 pulling it's special train towards the Chama River bridge. I shot a few pictures of the train before waving to most of the passengers aboard that train. As it steamed from sight, I wondered where I would see the train at later today. We finished breakfast before we packed up and drove to the Chama depot. While my parents found a deli to get some sandwiches for lunch, I walked into the yard to have a look around. I first shot a picture of our thirteen car train being led by the C&TSRR K-36 489 before venturing through the yards. There I found the TTC&PRR # 5, a 2-4-2, the silver Rotary OM, K-37 492, K-36 482, Diesel # 19 and Rotary OY. I walked by the roundhouse, water tower, sand house and the coaling tower all looking like they might have over 100 years ago. I walked out of the yard back to board the train feeling like I had just walked out of a time warp. I met my parents and we boarded the train taking the a seat inside one of the old style coaches the C&TSRR was using at the time. Once my ticket had been taken, I walked out into the rear open car to wait for departure. Right at ten in the morning, the 489 whistled and off we went. We passed through the yard by the sand house, water tower and coaling tower before running by the campground and crossing the Chama River. We passed the Juke Tree before crossing State Highway 17 and travelling across an outwash plain. We entered The Narrows where we started up the 4% grade towards Cumbres Pass. After over a mile of climbing we left The Narrows and reached Weed City at the Lobota siding. There are cattle pens and the site had been used for a movie set in the past. The train then slowed for the high Lobato Trestle before climbing away from Wolf Creek by the Lobo Lodge as the cloud turned dark and the temperature dropped. I was sure glad the I had brought my UP Jacket even though it's the first day in August, It's getting colder as we climbed. The 489 was really working hard on the steep grade. We ran along the highway before we crossed the highway and running above Wolf Creek. We crossed into Colorado before reaching Cresco which has a siding and water tower. As we continued to climb we passed Hamilton Point. We crossed the highway again before we went through Coxo. From here we ran to near MP 332 where we turned back across the valley to climb the slope of Windy Point. We had a great view all the way back to Chama and into New Mexico. We rounded Windy point with the 489 working it's hardest of the whole trip to pull us up to there summit as the highway quickly climbed to join us and we arrived at Cumbres Pass and stopped in front of the Cumbres Station as the 4% climb had come to an end. Off to the left is the remains of the snowshed over the wye tracks which are decaying. Once on the move again, we crossed Highway 17 again before we curved to the south to travel around the Tanglefoot Curve. At one point there opposing tracks are less than a stone's throw away. We crossed Cumbres Creek before running above it and the highway. We turned north into the Los Pinos Valley and ran to the Los Pinos water tower where we took water. On the move again, the sun returned as we made a horseshoe curve crossing the Rio de Los Pinos and heading down the east side of the green valley. At the end of the valley we steamed east staying high above the Rio de Los Pinos and at Cascade Trestle we crossed high above Cascade Creek. Over a mile east we arrived at Osier where we stopped for lunch. Our train had arrived first so after a few pictures of our train before we climbed up the grassy hill that overlooked Osier. Off to the east I could hear the sounds of a steam train coming and minutes later the train from Antonio arrived with me taking pictures. We had a nice picnic lunch before our locomotive switched onto the rear of the Antonio train while the engine 484 from that train switched onto the point of the Chama train. We boarded the Colorado train after the New Mexico train had left. The 488 east headed southeast into the Toltec Gorge crossing back into New Mexico. As we went deeper into the Toltec Gorge we passed the volcanic Conejos Formation and reached the Garfield Monument. The idea for the monument came from a group on an excursion train on September 26, 1881 the day of the funeral for the assassinated President Garfield who stop here to view the gorge and later paid for the monument to be built here. We went through Toltec Tunnel # 2 also known as Rock Tunnel, a 366 foot curving bore. We crossed back into Colorado before we passed the Toltec Section House and crossed Toltec Creek before going through the Calico cut. Less than a mile further we rounded the Phantom Curve with it'd tall pinnacles. Spires and pedestal rocks before crossing back into New Mexico. We next enter Toltec Tunnel # 1 also called the Mud Tunnel, a 349 foot bore. We arrived at Toltec siding where we met the Rio Grande 488 sitting in the siding with it's photographers shooting pictures of our train for a change of pace. We wound our way high above the Rio de Los Pinos to Sublette where we stopped to take on water giving us a chance to look around the section houses. As we left Sublette the rain started forcing me inside for the first time today. We ran around to the east side of the Canada Jarosita out to a point where we turned north to the head of the Canon Atencio. We made another horseshoe curve before making another one at MP 301. We turned east and ran to Big Horn where there is a wye with Bighorn Peak to the south. We crossed back into Colorado before we reached the Whiplash Curve with good views of the Conejos Valley and Los Mogotos to the north. Between here and MP 295 we passed the Big Horn section house and crossed the state line of New Mexico/Colorado three times. We travelled down a lava capped mesa to Lava which has a water tank and passed the Lava Loop used for turning snowplow trains. We headed northeast and after MP 390 made another horseshoe curve crossing the state line two more times before crossing it one final time and entering Colorado. How many times did we cross the New Mexico/Colorado border? Eleven! We turned northeast crossing several small streams along the way as well as crossing a cattle guard. We reached the flat valley floor and crossed the Canon Irrigation Ditch before running across US Highway 285 and entered Antonio where we ran around the balloon track to stop in front of the depot there. 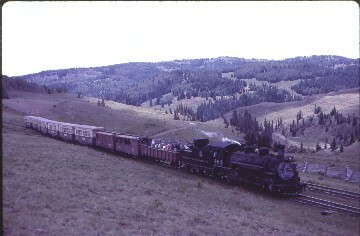 After an eight hour fabulous narrow gauge train ride, we boarded a Ford twelve passenger van for the forty five minute trip back over Cumbres Pass, passing the special Rio Grande train around Cresco. We got into the camper and drove to the Highway 17 railroad crossing east of the Chama River where we waited so I could get one last picture of the special train before we returned to the campground for the night. The next morning after breakfast it was raining as we drove back to the railroad crossing so I could get on last shot of the Cumbres and Toltec Scenic Railroad. 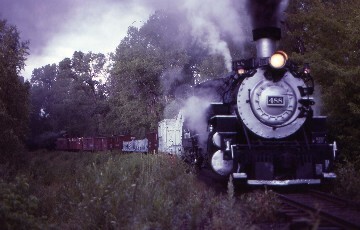 About twenty minutes later in a light rain engine 484 lead the eastbound train towards Cumbres Pass. We drove west and lost the rain about twenty miles west of Chama. We had a nice drive to Durango stopping at the depot to pick up our roundtrip tickets to Silverton for tomorrow. We drove four miles north of town to the United Campground which just happened to have the Durango and Silverton Railroad running right through the middle of it. First the K-28 476 led a southbound train back from Silverton. Next came the K-28 478 pulling the northbound train to Cascade Canyon. About thirty minutes later, K-36 473 with a wedge snow plow and the K-36 481 double headed the second train back from Silverton. After that great Durango and Silverton action, we drove into Durango where my parents went to Safeway for supplies and I walked over to a liquor store to get a supply for a few days. We then went to the Diamond Circle Melodrama where we had dinner and watched a very good show. We returned to the campground and I walked over and sat on the train tracks having my nightcaps under the light of a full moon before I called it a night. It was a sunny morning us we drove into Durango and parked at the train station lot before I waited for the K-28 473 to pull our train to the platform. After the usual rounds of pictures taken, I boarded the covered open car for the roundtrip to Silverton. Right on there scheduled time, the 473 whistled off and started it's pull forward. The train crossed the busy Highway 160 and started north through town passing the Safeway we stopped at last evening. Durango is a very interesting town with the combination of new and old buildings standing side by side. We crossed the Animas River before heading out of town. We crossed Junction Creek as we ran along the banks of the river. We travelled through Animas City before reaching the United Campground where we had stayed last night with all the campers waving us we passed through. The river meanders as we pass Home Ranch siding and minutes later passed by a waterfall on the cliff to the west as Fall Creek drops into the Animas River Valley. The mountain crests are now seen to the northeast while to the west Great West Mountain stands guard over the valley below. We pulled north up the valley to Hermosa Creek before we passed through Hermosa where there is also a siding here. North of Hermosa, the tracks cross Highway 550 as we ran below Missionary Ridge. We passed the 800 foot Pinkerton siding, which was built in 1982 after the Durango and Silverton had bought the line from the Rio Grande who owned it when I last rode over it as a kid. The tracks climb to gain elevation to leave the valley which has narrowed and we are now following Elbert Creek to led us up to Rockwood. We ducked under Highway 550 before entering Beaver Canyon Creek that took us to Rockwood. 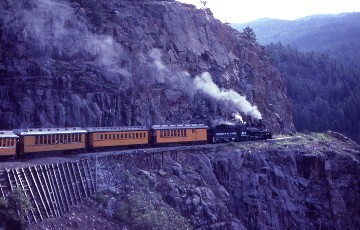 The train then entered the Rockwood Cut and then run by the "Entering the Animas River Canyon signpost." The Highline was what I remembered most from my previous trip on the DRG&W. The line when built was blasted out of the solid rock to create a shelf for the tracks and is 400 feet above the Animas River. There is a permanent slow order on the railroad here and that's a good thing as it is the most spectacular location on the whole Durango and Silverton. The camera were clicking away while many video cameras were activated during our passage over the ledge. Down in the river a whirl pool could be seen. We crossed the 130 foot cast iron deck-tress bridge and the scenery is incredible. We crossed Canyon Creek with the train looking beautiful as it snaked along the river before coming to Tacoma with the Colorado-Ute Electric Association's Tacoma power plant across the Animas River. Our next location is the Ah Wilderness which can only be reached by the train, on foot or on horseback. We next cross Tank Creek before stopping to take on water there. We next ran by the Tall Timber Resort with the same restriction to access as the Ah Wilderness. Continuing north we crossed Grasshopper Creek before we arrived at Cascade Canyon where there is a wye to turn the Winter and Summer afternoon trains. We stopped here to let a pair of hikers off. 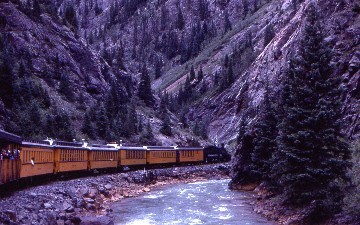 The Durango and Silverton will drop off passengers anywhere on their route through the Animas River Canyon. We crossed the Animas River again before our passage through Tefft. Later on our journey, we passed the Needle Mountain signpost where I could see Pigeon Peak on the left and Turret Peak is on the right. A few miles of beauty further, we crossed Needle Creek and if you look upstream you can see the high peaks that gave the San Juan Mountains their nickname of the "Alps of America." The train next steamed through the area called the Needletin Snow slide as that what this area experiences almost every year. Across the river Needle Creek joins the Animas River and a few miles on we reached the Needleton Siding and the Needleton Tank. Looking up the river to the northeast Mt Garfield and Mt Graystone of the Grenadier Range became visible. We crossed Ruby Creek with NO Name entering the other side of the canyon less than a mile later. I walked to the snack bar car for a Coco Cola at this point of the trip as I was thoroughly enjoying this second trip over the line. While I thought it was fun as a kid, I was enjoying this trip even more. Across the Animas River was the Garfield Slide before we passed the Red Young Slide zone on our side of the river. We crossed the Animas River again on a two span 222 foot deck girder bridge, We crossed Elk Creek before we passed through Elk Park. We next went by the Grenadier Range signpost before Snowflake Creek joined the Animas River to the west. The Silverton then crossed Whitehead Gulch before we passed through the Snowshed Slide given that name that there once was a snowshed here. Grand Trunk peak became visible to the northwest and a few minutes later Sultan Creek entered the Animas River from the west. We ran by the Twin Sister Slide before doing the same thing fourteenths of a mile at the Cleveland Slide. We next crossed both Deer Park and Kendall Creek while seconds later to the west Cataract Gulch came into the canyon to the west. We left the narrowest part of the Animas River Canyon as Deadwood Gulch entered the canyon from the northwest. On the west flank of the canyon is the Detroit Mine before we crossed the deck bridge over the Animas River for the last time. We crossed Mineral Creek a few minutes later before we passed the wye that the train would be turned on after our departure from Silverton. 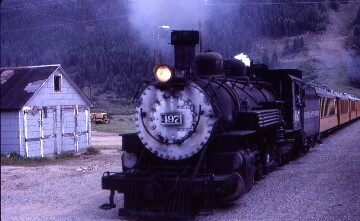 The Silverton steamed by the old depot now used by Sundance Publications. We turned to the west and ran down 12th street stooping at Kendall Street ending our northbound journey to Silverton. We detrained and after the customary photography of the train we went and went to have lunch. I then tried a few of the bars before walking down by the Silverton depot to wait for the second train to Silverton of the day. Returning to the train, I photographed the two train sitting side by side on 12th street before reboarding the train for the return to Durango. The trip was very interesting even with a mid afternoon down poring of rain so common to these mountains. I shot more pictures all the way back and the Highline was again done in perfect light. We returned to the United Campground in time to shot the second train's return from Silverton as well as the Cascade Canyon train twice. We spent another nice evening in the camper. The next morning, we drove west into Utah and once onto US 666 I was on new highway mileage. We took 666 west to Monticello before turning south to Blanding on US Highway 151. South of town we turned west on Utah 95 which took us to Natural Bridges National Monument. After a brief stop to look at the bridges and to have lunch, we continued west on 95 crossing the Colorado River at Glen Canyon National Recreation Area. We stayed on 95 to Hanksville where we turned onto Utah 24 for the trip through Capitol Reef National Park. we stayed on this road to US 89 which we drove on this old friend of a highway to Gunnison before reentering new highway on Utah 28 which we took to the BLM Painted Rock Campground for the night. After a good night's rest, we drove north on 28 to Nelphi ending the new highway mileage of the trip for the old friend Interstate 15 north to Pocatello, Idaho. I spent two days with Bruce, Karla, Eric and Adam before leaving at 4:00 AM in the morning a driving through the worst thunderstorm of my life at this point south of Ogden. The Pinto drove well and following an overnight stop in St George, Utah, I got up early the next morning to avoid the heat of the desert and returned home to Santa Ana giving the keys to the Pinto to my brother Duane thus ending a narrow gauge railroad adventure.